St. Louis, MO – Hot shooting propelled No. 2 seed Tennessee to a commanding 84-66 wire-to-wire victory over the sixth-seeded Arkansas in the semifinals of the SEC Tournament on Saturday afternoon at Scottrade Center. The Vols (25-7) are advancing to their first SEC Title game since 2009 and will face the fourth-seeded Kentucky Wildcats. Jordan Bone  fueled the offense with 19 points and four assists on the day. He was one of five different Volunteers to eclipse double-digit scoring. Admiral Schofield  posted another strong performance with 16 points, seven boards and two assists. Kyle Alexander , James Daniel III  and Grant Williams  all added 12 points apiece. Alexander also finished with seven rebounds and two blocks, while Williams had five boards, four assists and a block. The Vols put on a show offensively, shooting 57.1 percent (28-of-49) from the field. That percentage just narrowly missed Tennessee’s season-high of 57.5 percent at South Carolina on January 20. UT did surpass its season high for three-point shooting with 64.7 percent (11-of-17) from deep. Despite a 19-point deficit at the break, Arkansas (23-11) didn’t go away quietly. An 8-0 run pulled the Razorbacks within 11 point with 15:24 remaining in the game. To begin the half, UT was 1-of-8 from the floor. 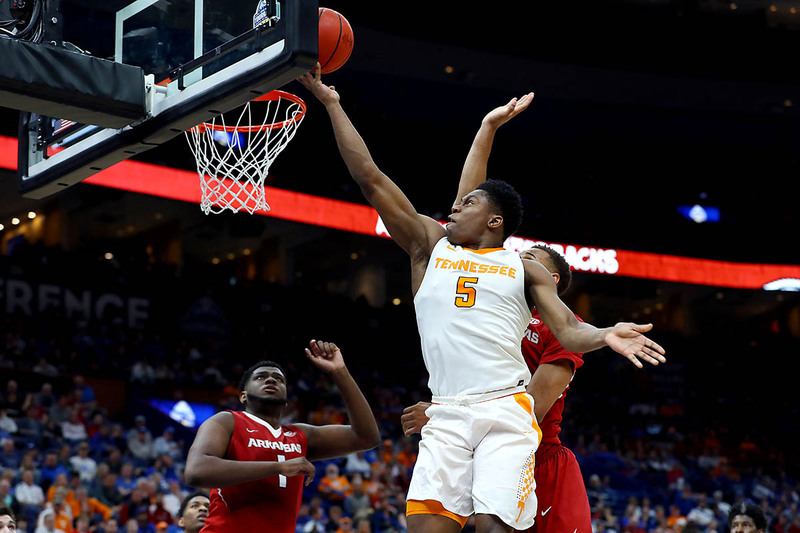 Tennessee would not relinquish its lead, though, converting on 14 of its 16 trips to the free throw line during the frame to halt any possible comeback by the Razorbacks. The Vols had a hot hand to begin the game, converting on five of their first six shots to take an 11-7 lead into the first media timeout. Bone got things going with a quick jumper to open the game followed by a deep three a few possessions later. That was just the beginning UT’s hottest shooting half this season, going 19-of-25 (76 percent) from the field to take a commanding 48-29 lead into halftime. Bone was 7-of-7 from the floor for 17 points in the period. A 17-2 run opened things up for Tennessee, who was also stout on the defensive side of the ball with six blocks. Daniel and Schofield both chipped in 11 points in the half as well. For the first time since 2009, the Tennessee Volunteers are advancing to the SEC Tournament Championship. After claiming a share of the regular-season title for the first time since 2008, UT will be looking to win its first conference tournament championship since 1979. During the first half, UT shot a blazing 76 percent from the floor on 19-of-25 shooting to take a 48-29 lead into half. 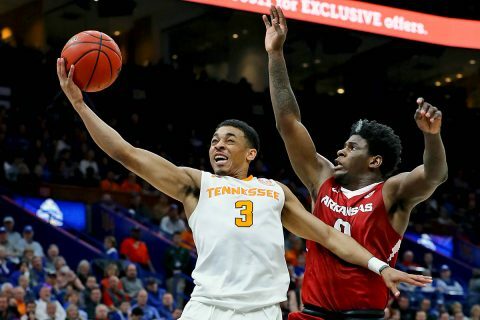 That marked a season high for field-goal percentage in a single half this season by the Vols, surpassing 71.4 percent against Ole Miss at home on February 2nd. Tennessee won that game, 94-61. Jordan Bone  could not miss from anywhere on the floor during the first half, dropping 17 points on 7-of-7 shooting and 3-of-3 from deep. He also dished out three assists to help UT jump out to a 19-point advantage at halftime.